I have few recipes in the pipeline waiting to be uploaded. 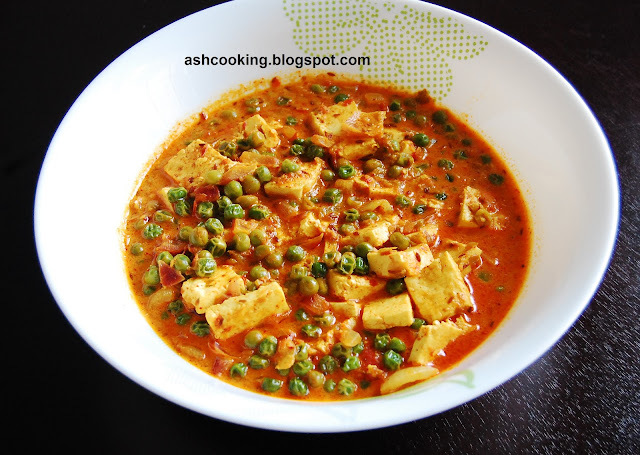 Matar Paneer is one of those from the collection. 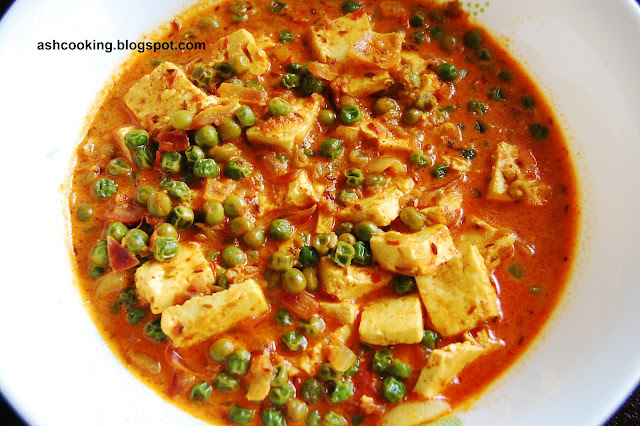 Matar Paneer is a popular North Indian curry with green peas and cottage cheese used as base ingredients bursting with wonderful flavours of tomato and cream based gravy. Each morsel of this dish combined with a piece of roti or mixed with the grains of rice caters to the exquisite sense of your palate. Indisputably, it is one of my all-time favourites among vegetarian dishes. 1) Heat oil in a pan. When oil becomes piping hot, add cumin seeds and allow them to crackle. 2) Then add onion and fry till translucent in color. Add ginger-garlic paste, tomato puree and green chilli paste. Sauté for 2 minutes. 3) Add the powder spices - turmeric powder, cumin powder, coriander powder and kashmiri red mirch. Sauté for couple of minutes till the spices blend into the mixture. Add 1/2 cup of water if the mixture turns dry. 4) Toss in the green peas and sugar. Add yogurt. Cook covered for 5 minutes on medium heat. 5) Now add the whipping cream and salt. Slide in the cubed paneer. Cook covered for 2 minutes. 6) Finally before turning off the heat, sprinkle garam masala powder on top. 7) Serve hot with roti, chapati or naan. It can be had with rice too.